When I moved here 12 years ago from Alberta, I didn't know a soul here. Since I was an introvert, that made it even harder to connect with other people. My first few years on the Alley was mostly spent fishing alone. I didn't mind, because I wanted spend as much time as possible on the water. It was a unique fishery as I never fished this type of water. My first impression of the rivers was how on earth does this support any life? Most of the rivers here flowed over shale bedrock and the water was clear. 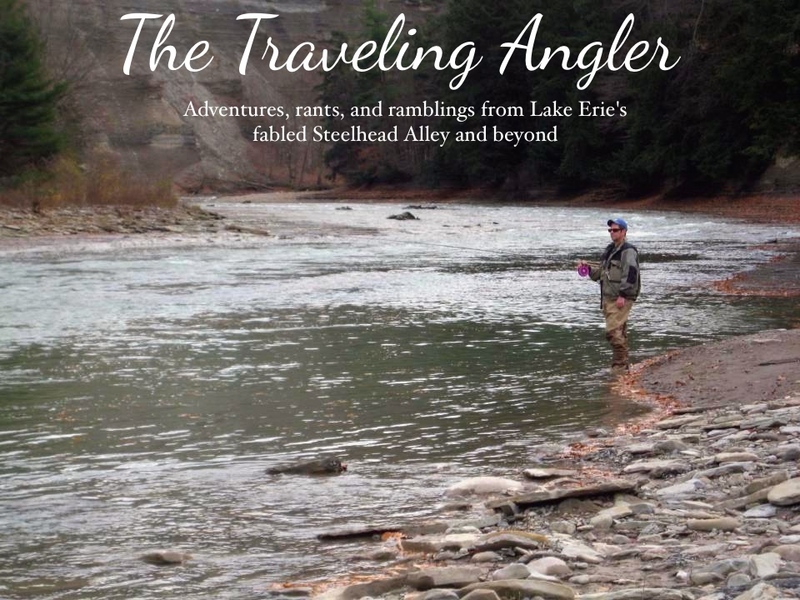 It looked so sterile and it would be the last place for a steelhead to be. But these rivers did support a large number of them and I was eager to start learning. I decided to venture far from home. The river I would be fishing today, would be the Ashtabula. 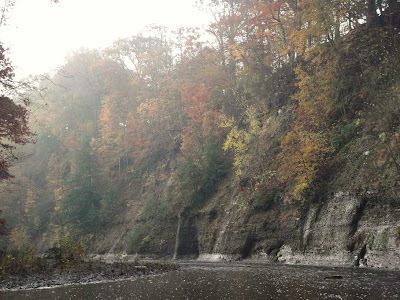 The Ashtabula is a river that isn't stocked by the state of Ohio. But the river does get quite of fish. It's the smallest of the Ohio's rivers in length and size. After a rain event or snow melt, it's the first river to be fishable. It was a fairly chilly morning out as the temperature was hovering a few degrees above freezing. I wasn't in a hurry today as I arrived at first light. Walking down to the ravine I could see the signs of the first frost of the season. It was eerily quiet as the only sounds were my boots rustling the leaves on the ground. I could see the my breath as I looked to the horizon waiting for the first rays of sunlight. Looking down the water had that dark tea color and there's a smile on my face. Because that meant, I had a good chance of getting fish. As with every fall the trees litter the streams with leaves and in some spots the piles in the water can be measured in feet. As the leaves start to decompose, they release tannins and the water starts to get that dark tea color. Some steelheaders believe that tannic conditions can affect fish as it effects the PH level in the water. I started believing that as I fished several spots that hold a lot of fish when the water is lower. I plugged away working the deeper cuts and ledges. A few hours into the morning, I managed one small hen. The day before I got a report that the fishing was outstanding but that window of prime conditions closed Sunday morning. As the morning progress, I could see bottom in a lot of spots and that same spot we fished the week before and caught over 10 fish when the river was higher was visible right down to the bottom. I checked the time and it was almost ten and I knew I needed to make a move. I drove over to the next river and it was in much better condition color wise but the flow was still strong. Usually when flows are strong, steelhead generally don't tend to hole up. Even though there was a lot of leaves in the water, it had more of a clay based stain, but the visibility was good. The first spot didn't produce and usually when nobody is there at eleven - the fishing sucked. I knew it was going to be one of those days of banging spots all the way up river. That was the case as I worked seams and tailouts and it was one or two fish here and there. I guess I was one of the lucky ones because a lot of people I talked to got shut out. As I drove back back home I stopped at Harpersfield dam to see what the Grand looked like. As expected it was high and unfishable, but I wondered how many fish made it up as last year it was dismal. Last season was the first time I didn't fish that section of the river because of very low numbers of fish. With no rain for the rest of the week, it looks like I might make a visit there this weekend. Nice post. I actually prefer fishing alone because everyone makes me feel like a guide sometimes. Actually, my wife is a good fishing partner.